All enemies have a small chance to drop Bonfire Ascetics. 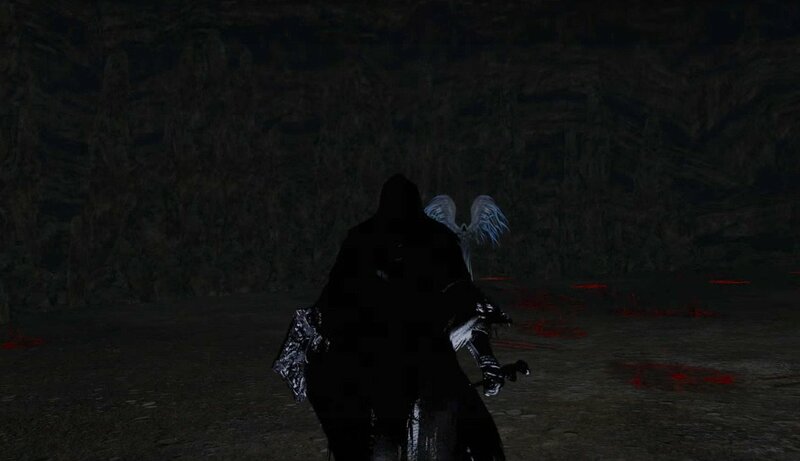 From a lore perspective, the Dark Chasm of Old appears to be the same area associated with Oolacile and Manus from the "Artorias of the Abyss" expansion in the original Dark Souls. Following the hints provided in the story, the Dark created from the destruction of Manus became fragmented and separated, slowly crystallizing into new creatures of the Dark. The Dark Chasm of Old reunites the player with powerful warriors from Dark Souls who (presumably) succumbed to the Dark and have been reborn in the Dark Chasm from their dark soul fragments. The player traverses Dark Chasm and defeats these Dark creatures (and brings fire back to the Dark) to awaken and strengthen the dark soul inside of him or her. 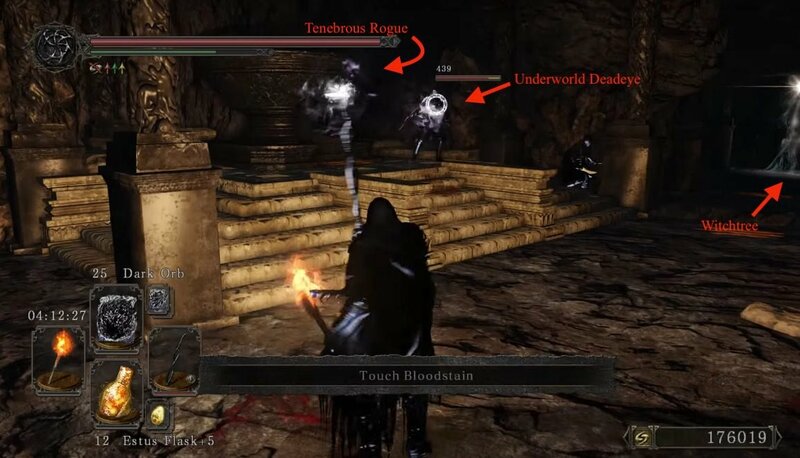 While the Dark Chasm of Old sites can be accessed in any order, there appears to be a progression in terms of the difficulty of the enemy phantoms, with easiest to hardest in the following order: Shaded Ruins, Black Gulch, and Drangleic Castle. The Dark Chasm of Old is part of the Pilgrims of Dark covenant quests, and is only accessible to covenant members. After joining the covenant, the player can speak to Darkdiver Grandahl in any of his three locations and offer him a Human Effigy to open a portal into a Dark Chasm of Old. The goal of each Chasm is to defeat all enemies and invading players, light the sconce, and exit through the hole at the end without dying. Once the sconce in each Dark Chasm has been lit, attempting to exit the chasm normally will instead lead to the Darklurker boss. Once you have completed all three areas, any of the three will allow you access to the Darklurker boss. However, you must recomplete the area in order to do so. Since Human Effigies are necessary to enter the Dark Chasm of Old and Flame Butterflies are necessary to light the sconces and fight the Darklurker, it is recommended to stock up on these before attempting. Entering each Dark Chasm requires you to find Darkdiver Grandahl in the respective areas. From the petrified Lion Warrior guarding a chest, and the basilisk, head to the ruined building across. There is a grassy area and a few trees to the right which has another collapsing floor near the left corner. This will drop you on the same platform as him. Drop off the right side of the area right around the Cragslippers. Aim for the small platform directly below. Here, enter the cave and find the man himself. In the room with the 6 Golem Doors, the last one on the left will drop you down to him. In general, you can draw this one out first. Like her Red Phantom version (Nameless Usurper), she wields a dagger and is extremely quick. In close combat she will attempt to guard break you and then slash away. Because of her rapid movements, either ranged battle, shield plus rapier or spear, or stunning attacks are very valuable. A.K.A Dark Pharis, will attack with a bow at distance and when in close range will switch to a sword. Finally, the Witchtree Spirit (located near the back of the first chamber) will cast Lightning and Force miracles, or Magic Barrier and Great Heal if given the chance. Due to casting time, if it draws close you can easily defeat it with melee attacks. After lighting the cauldron, there is a lift at the back, leading down to another open area with a second Tenebrous Rogue. The same strategy applies here as well. After defeating her, the fog gate will appear. You can jump into the foggy pit at the end, which will either transport you back to the Dark portal or will take you to Darklurker (depending on your progress). This one wield TWO hammers, and can attack easily with both. It is important to try and aggro him and draw him up towards you. A.K.A Dark King Jeremiah, has a high tendency to follow the attack of the previous enemy, and will begin using pyromancy against you (including the Forbidden Sun pyromancy from Royal Sorcerer Navlaan's questline). You can reduce the damage of his fire attacks by getting wet (either by rolling in the water at the bottom or standing under a waterfall), but this will also increase the damage of the Witchtree's lightning bolt and emit force spells, so be careful. In melee you can use attacks to stop his pyromancy, so it is possible to back him against a wall and just hack at him each time he tries to fire off a spell. In spite of his own pyromancy, pyromancy does damage him to the same extent (it seems) it does other enemies. You can defeat this one using ranged attacks, after dealing with the first Ironclad, and Xanthous. An alternate strategy is to just cast Profound Still, which will block off both Xanthous and the Witchtree ability to cast spells, making them much easier to deal with. Don't forget to turn left in the hallway just after this room and light the cauldron, but watch out for the giant hole in front of it. Follow the wall on the right to safely bypass it. The second area contains another Ironclad, a Xanthous, and a Witchtree Spirit (staff), with the same strategy applicable: bait the Ironclad out first, then repeat whatever you did to kill King Jeremiah the last time. Since this Witchtree casts sorceries instead of miracles, you won't have to worry about water increasing the damage of its spells. After dispatching them, jump into the foggy pit at the end to either exit the dungeon or challenge the Darklurker, depending on your progress. Your first enemy is Dark Havel to your left. The battle is very much like that in Dark Souls, with his main attack being a heavy attack with the Dragon Tooth. This attack IS parryable, and backstabs are possible. Try to draw him forward, as the next enemy may become aggro'ed and join in, creating a rapidly deteriorating scenario for the player. 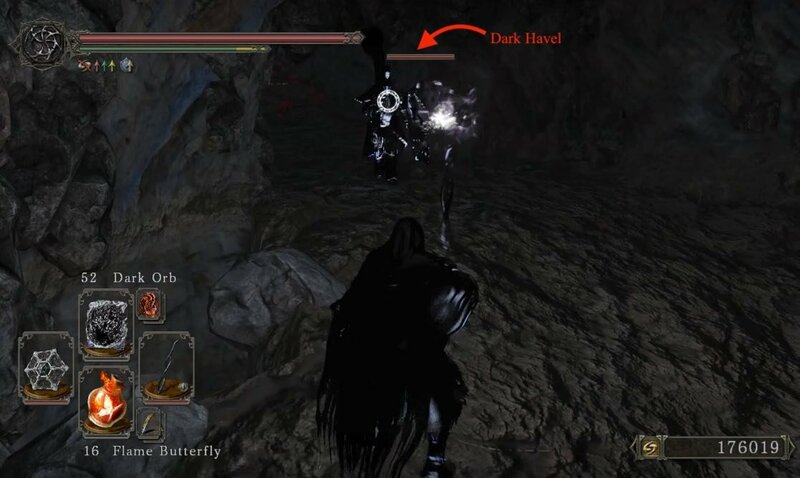 Once you've defeated Havel, you can head slightly forward and to the right, where you will be able to see this enemy -which is a darkened version of Ricard- in the tunnel. Like his character in Dark Souls, he uses a rapid rapier attack technique. Using ranged attack or waiting for your opening to attack him is ideal as a strategy; you can also strafe behind him during some of his moves for a backstab. To the left of the Prince, is both the cauldron and this enemy (same strategies apply). The last enemy in the first area is an female Dark phantom. She is located in front of a pit, so rushing in to attack her will lead to an embarrassing death. As with the Flexile Sentry you can use this map element to your advantage either using it to keep her away from you or knocking her into it. After defeating her, the fog wall behind her will lift and you can exit the chasm. The easiest way to kill all of the melee enemies is to simply aggro them one at a time and draw them all the way back to the beginning. Make them fall into the water at the back of the start point and go back up the ramp. They won't follow you, so you can just shoot them with arrows until they die. If you have 12 Faith you can breeze through this level using Force to push the melee enemies off the ledge, though you will still have to kill the shade. This makes for a quick and easy route to challenge the Darklurker, and isn't a bad method to farm souls (7800 first playthrough). After you've lit the scone in each of the three Dark Chasms, attempting to leave a Dark Chasm through the foggy pit will cause you to enter the Darklurker's boss room instead. See the Darklurker page for more information on this boss, along with strategies for defeating it. After defeating it, you'll be able to exit through another hole and return to the surface. If you use a Cracked Red Eye Orb while in a Dark Chasm of Old, you will invade another player who is in any of the three Dark Chasms as an abyss spirit. If you use a Red Sign Soapstone, your red sign will appear in other player's worlds exactly where you left it, and they can use your red sign to summon you as an abyss spirit. There is a rumor that the red sign soapstone will allow you to automatically invade players in the dark chasms similar to the Looking Glass Knight; this is false. Aside from causing you to invade as an abyss spirit instead of a dark spirit, the red sign soapstone does not function any differently than normal. Defeating another player while in a Dark Chasm of Old (either as a host or as an invader) will award you with a Bonfire Ascetic. Since other players drop Bonfire Ascetics 100% of the time, this can be a very fast and effective way to farm for Bonfire Ascetics, provided you have Cracked Red Eye Orbs or a Red Sign Soapstone. Killing players as an abyss spirit does not give you sin. Note: invading and killing invaders has no bearing on covenant rank, but the Dark Chasm must be completely cleared of enemies and invaders before the host can progress through the area. Invaders basically act as additional enemy phantoms for the host to overcome. Only members of the Pilgrims of Dark covenant can enter a Dark Chasm of Old, so only Pilgrims of Dark covenant members can invade there. 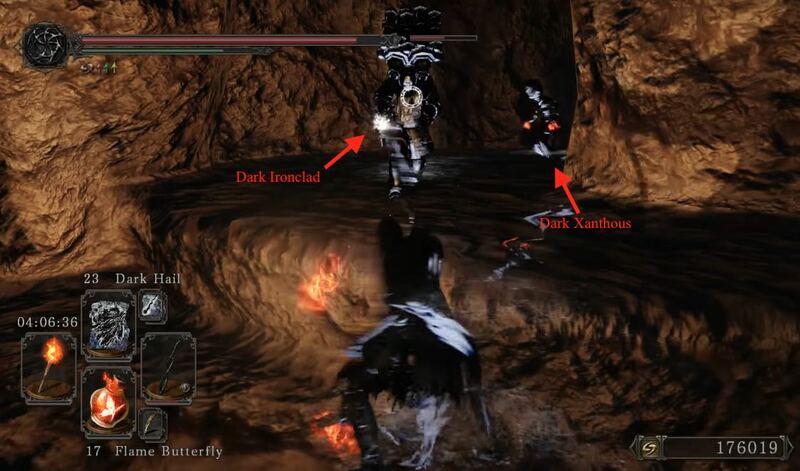 Players in other covenants cannot invade a Dark Chasm under any circumstances, even if they have global invasion (such as the Blue Sentinels). You cannot use the White Sign Soapstone in a Dark Chasm of Old, so it is impossible to summon another player for assistance while there. In fact, the Dark Chasms of Old do not have summon slots at all, and instead have three invasion slots. This means you can be invaded by up to three players simultaneously! But invaders may not necessarily be hostile towards the host, since they can simply kill another invader to receive a Bonfire Ascetic (at which point they'll be returned to their world). If you are hosting multiple invaders in a Dark Chasm, a simple solution is to just let them kill each other. The enemies in the Dark Chasms of Old are hostile to invaders, and will attack them as if the host had used a Seed of a Tree of Giants. This means that while you can use a Seed of a Tree of Giants while in a Dark Chasm, it will have no effect and the seed will be wasted. If you have ranks in the Brotherhood of Blood or Blue Sentinels covenants while invading in a Dark Chasm of Old, your invasion aura will carry over as an abyss spirit. For example, if you have reached rank 2 as a Blue Sentinel then join the Pilgrims of Dark covenant and use a Cracked Red Eye Orb in a Dark Chasm, you will have the blue aura while invading. (To you your character will simply look blue, but other players will see the full rank 2 aura). If you are wearing Black Dragon Armor and using any of the Black Dragon weapons, you will look like a Dragon Spirit while in a Dark Chasm. Abyss spirits can use Estus and other healing items just like the host can. Abyss spirits (Dark Chasm invaders) DO NOT have a timer, and can stay in a host's world until either they have died, the host has died, or the invader has landed a killing blow on another player (either the host or a different invader). There is no cooldown time on invasions in the Dark Chasm of Old. This means if you kill an invader, you have until their loading screen is gone before they can invade you again. And if there are no other players for them to invade except you, that is exactly what will happen. If there are any abyss spirits in your world, the fog wall blocking the exit will not lift until they are either dead or gone. This means you cannot leave the area or challenge the Darklurker until all invaders have been defeated. If the fog wall is still there even though you've killed all enemies in the area, it is a sure sign you're being invaded. If you are invading in a Dark Chasm of Old, your goal is to defeat a player, be it the host or another invader. Once you have landed a killing blow on a player the "Target Destroyed" message will flash on your screen and you will be returned to your own world with a Bonfire Ascetic and souls, and your equipment durability, Estus Flask uses, and spell charges will all be restored. But this is not an easy goal, since the enemies will attack invaders along with the host. Make sure you can deal with anything the Dark Chasm can throw at you before invading!